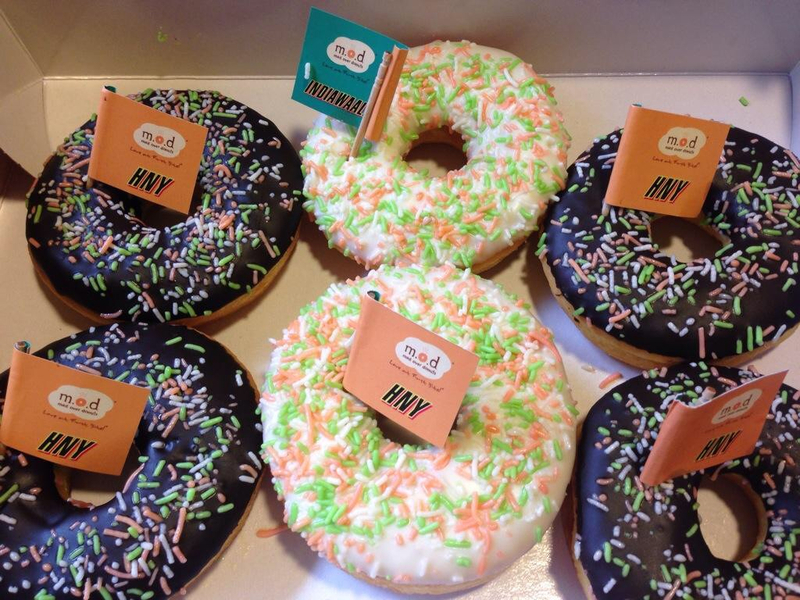 Mad Over Donuts promoting ‘IndiaWaale Donuts’ from October across their 54 stores in the Country. The Country’s most loved donut brand Mad Over Donuts associates with one of the most eagerly anticipated Bollywood entertainers of 2014 – HAPPY NEW YEAR! Directed by Farah Khan and produced by Red Chillies Entertainment, the films Starcast includes Shahrukh Khan, Deepika Padukone, Abhishek Bachchan, Sarah Jane Dias, Boman Irani, Vivaan Shah, Sonu Sood and Jackie Shroff. The trailer of the film was released at a suburban hotel in Mumbai today. The Film is scheduled to release on the 23rd of October 2014. As a part of the association, Mad Over Donuts has created a special “IndiaWaale Donut” to go with the theme of the Film. This special Donut was an integral part of the Trailer release event today and one could not miss the colorful donut boxes being sashayed around by the celebrities as well as the media fraternity present there. Tarak Bhattacharya – COO, Mad Over Donuts said, “We are very excited to associate with Happy New Year. Its one of the most promising entertainers of the year and being a part of the film promotions is a great feeling. Currently Mad Over Donuts is the largest donut chain in the country & this will ensure that the specially created ‘IndiaWaale Donut’ reaches out to a huge base of loyal customers across the Country”. Mad Over Donuts will be promoting the specially created ‘IndiaWaale Donuts’ from October across their 54 stores in the Country and will be priced at Rs. 59/- per donut.